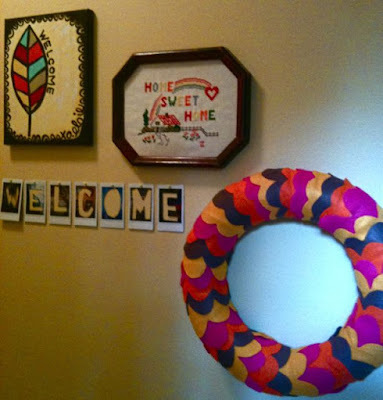 I absolutely fell in love with the wreath that Rachel posted on her blog :) She's soooo cute isn't she? The lighting is sooo bad, sorry! It's in my little hallway and I took the pic with my phone...you like? Also, here are our pumpkins for this year. I really wanted a white one. Love all your decorations on that wall!!! So great! I LOVE the wreath! We are all about the white pumpkins at my house this year! that wreath is ADORABLE! LOVE what you did with it! I really need to get on doing some of my projects! Oh and by the way.... I made your painting last night. You want to see a picture!? I'm too excited to wait! i'm jealous of your pumpkins! are you going to bake anything with them? 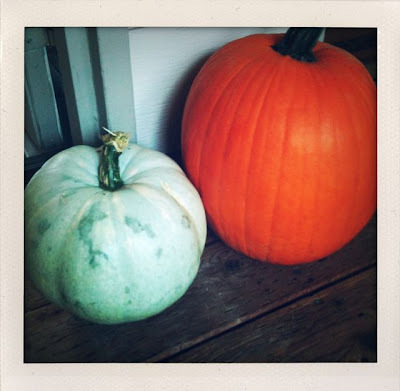 i'm dying to bake a pumpkin pie and some pumpkin seeds. 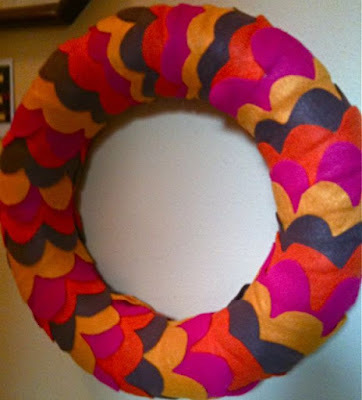 Love the colors of your wreath! That entry just keeps getting cuter!